Tamron has developed a range of high-precision lens components. 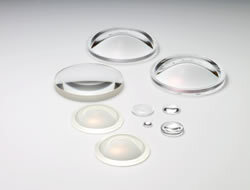 The lineup includes various aspherical lens elements, thin film-coating products using special multi layer films, and ultra-high precision test plates that can quickly and accurately verify the profile irregularity of lens surfaces. In the area of test plates in particular, Tamron accepts orders to manufacture flat and spherical test plates that have been polished with skilled craftsmanship.